A haircut and a blood donationDoctors throughout history have been overzealous in draining their patent’s blood. Bloodletting or "bleeding" was administered by cutting a vein with a lancet, drawing blood to the skin’s surface with hot cups or the perennial favorite—leeches. Doctors at the time believed that the body was made up of four humors (blood, phlegm, black bile and yellow bile.) Disease and illness caused a person’s humors to become unbalanced and bleeding could restore this balance. In Charles’s case they not only cut his skin, but also shaved his head and applied red, hot irons. The Royal PedicureAfter losing so much blood, Charles must not have been feeling fresh. 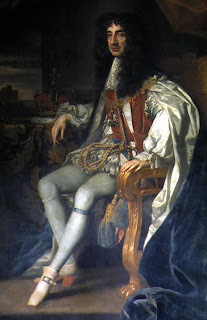 Luckily, doctors had some spare pigeon poop lying around to smear on the king’s feet. Animal feces during the 17th century were believed to have many curative properties. Have a nose bleed? No problem. Just rub some pig manure on it. I still have not found why doctors used feces in medicine. It seems like a wonderful way to get a bout of tetanus going. Everyone loves a nice hot bowl of chicken soup when they are feeling sick. Charles didn’t get any soup. Instead, his doctors fed him various herbs, boiled spirits from a human skull, bezoar stone, and the very poisonous antimony. First off, you can’t imagine what antimony tastes like unless you like to lick batteries. Antimony is great as a semiconductor and is used today in batteries and cable wires. It's not so tasty as a medicinal cocktail. Why make the king eat battery acid? The answer is simple. They were trying to make him barf. Charles’s doctors believed that purging would clean out your insides. Doctors even sometimes used a device called a “stomach brush” to wash the stomach clean. (The brush looked like a toilet bowl cleaner with a wire handle.) Doctors would lower the contraption down the throat by turning the wire handle and then move it up and down like they were cleaning drainpipes. Ya, I could see how you might think that one would work. Who here has not felt a bit “dirty” after scarfing down Ben & Jerry’s? Unfortunately, instead of cleaning your insides, the brush caused internal bleeding. Ouch! Next, spirits from a human skull was the green moss scraped off a human skull. In the 17th century, ground-up mummies were mixed into tea and used to heal bruises, fractures, migraines, epilepsy, coughs and disorders of the liver. Mummy powder was even used by artists to make their paints more vibrant. Mummy heads were especially coveted. 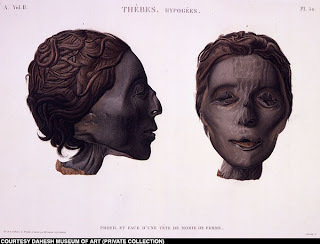 Napoleon brought one back from Egypt for Josephine (shown here). Nothing says I love you like human remains. 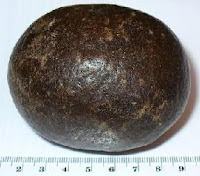 Bezoar stone was a rock-like mass found in the organs of goats. It was believed to be an antidote for poison. I have seen what goats will eat and anything stuck in their guts should just stay there. God Bless you. Sneezing can make your teeth rattle, but can also cure what ails you. Or so was the belief of Charles’s medical crew. The theory was that sneezing would correct the imbalance of humors in the brain so doctors blew hellebore up the king’s nostrils to make him sneeze. This treatment may not seem so bad unless you have smelled hellebore before. It has the distinct stench of decaying chicken. Ok so let’s recap. At this point, Charles had a bad hair cut, a terrible breakfast, very little blood left, his feet stunk and worst of all….he still wasn’t dead. It took four days for the poor king to kick the bucket. Always a good sport, the king actually apologized to his doctors for taking such a long time to die. I like Charles’s story because it illustrates a reoccurring theory toward medicine. The less that was known about a disease or illness…the more doctors tried out different cures. Although these cures seem ridiculous to us today, without medical experimentation doctors would have no way of knowing what worked. Today, we experiment just as much, except we do it on rats, monkeys and cancer patients. Wadd, William. Mems. Maxims, and Memoirs. London, UK: Oxford University, 1827.TURNER, E. S. The Astonishing History of the Medical Profession. NY, Ballantine Books: 1961.